If you can get on board with the price point, the HEM6s are a great pair of headphones that really sing when paired with the right genres. There was a time when the quality of in-ear headphones paled in comparison to their on-ear and over-ear counterparts. Partly the issue was one of perception, people associated the idea of in-ears with the cheap earbuds that came bundled with the early iPods and iPhones which had a weak tinny sound and poor bass response. On-ear and over-ear headphones meanwhile were seen as what you moved to when you wanted to upgrade from in-ears. They had a bigger sound, felt satisfyingly weighty in the hand, and after trying them out it was hard to see how the same level of sound quality could be provided by a device the size of a broad bean. There was a time when there was an element of truth to this. A smaller pair of headphones means smaller drivers producing its sound, and historically these haven't been able to match the quality of the bigger drivers found in over- and on-ear headphones. But that was then, and these days the quality of in-ear headphone drivers have more or less closed the gap with their larger counterparts. As a case in point, the Optoma NuForce HEM6 easily match the quality of a premium pair of over-ears, and prove that it's perfectly possible to have the portability of in-ears without sacrificing sound quality. 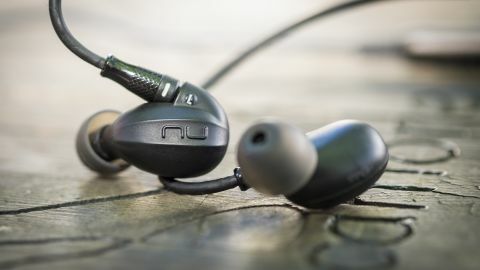 As well as the now standard three sizes of silicon earbud, the NuForce HEM6s come with an impressive number of accessories to allow you to modify them to your liking. There are two sizes of memory foam earbuds included in the package, which are excellent at blocking out out background noise but are less comfortable than their silicon equivalents. Also included is not one, but two detachable cables. We're big fans of this feature with how frequently cables break, and it's nice to see this feature become more common on in-ear headphones. One of the cables includes a basic in-line remote and mic which allows you to pause your music but is annoyingly lacking volume buttons. Also included is a high-end braided cable which dispenses with the remote (which creates a certain amount of signal noise) and is made of OFC (that's oxygen-free copper to you and I) and silver for a purer signal. When we compared the two cables directly we found that the supposedly high-end cable offered a fairly minimal improvement in sound, and we opted for the remote-enabled cable for convenience. The NuForce HEM6 headphones are one of four new in-ear models released by Optoma, and are the second most premium in the range. The main difference between the four models is the amount of drivers the earbuds contain. The HEM2 ($199/£199.99) contains just one driver, the HEM4 ($299/£249.99) two, and the HEM8 ($499/£499.99) contain a massive four. Meanwhile the HEM6 (priced at $399/£349.99) contains three drivers in each earbud, meaning that one driver is optimized for bass response, another for mids and a final one for trebles. Think of these drivers like a collection of speakers in a traditional hi-fi setup where you might have a separate subwoofer dedicated to producing bass frequencies. Jumping up to the HEM8s means you get a second driver focussed on bass frequencies and correspondingly the lower end of the frequency range drops from 18Hz down to 10Hz. The three drivers in the HEM6 means that the earbuds are a little larger than your average pair of in-ears, but their light weight, combined with their design meant that their size didn't get in the way of me enjoying them at all. Rather than their cable running downward from the buds, the lead actually runs out of the top of the front (it makes sense when you see it), with the expectation that you'll then hook the cable over the top of your ears. What this means is that if something tugs on the cable, then all that tends to happen is that it pulls against the top of your ear. We didn't once have the earphones fall out in the weeks that we used them for, which speaks to how well the earphones fit in our ears. The first thing that strikes you about the NuForce HEM6s is how beautifully tight and refined the bass is without taking over. From indie rock to straight hip-hop bass has punch without overwhelming, and is also surprisingly detailed. The bass drum in Rebel Heart by The Shelters for example actually sounds like an honest-to-goodness acoustic drum rather than just a deep thud devoid of any of the imperfections of a real instrument. But turn to a track which does use a synthesized drum track like Cuando Yo Te Lo Meta by Happy Colors and this same definition in the bass still pays dividends. Across its entire frequency range the sound produced by the HEM6s is incredibly warm and listenable. The guitars in All For One by The Stone Roses have none of the harshness in their overdrive that some headphones give them. Instead they sound effortlessly warm and smooth, with a good amount of separation between them. This warmth isn't always a good thing. Listen to a track with a bit more grit to it like Rolo Tomassi's Ex Luna Scientia and the overdriven guitar work doesn't quite have the same edge to it. It's not that it sounds bad, the sound separation on these headphones makes it easy to pull apart what is a very busy track musically for example, but ultimately these are a warm pair of headphones that feel much more at home with music that's a little cleaner. So give these phones a track like Mama, You Been on My Mind by Jeff Buckley and the HEM6s really shine, revealing subtle details in Buckley's vocals that really add another dimension to the song. The Optoma NuForce HEM6s might be an understated pair of headphones, but the quality of the sound they produce is truly phenomenal. That it provides this level of sound quality is good, but to do it without sacrificing any of the convenience of in-ear headphones is truly phenomenal, and we also felt that the form factor makes for a very comfortable pair of headphones to wear. Finally the detachable cables are an essential inclusion at this price point, there's no way you're going to want to throw these headphones away when the lead breaks. It's a matter of personal preference, but the sound of these headphones is a little on the warm side. If that doesn't match with the genres of music that you tend to listen to then you might want to try before you buy, especially with a pair of headphones at this price. The Optoma NuForce HEM6s are a great sounding pair of headphones, and if you're looking to spend this amount of money on a pair of in-ears then they're a very strong contender. They sound great, they're comfortable to wear for long periods of time, and they should last a while. In short they're (almost) everything a pair of headphones should be.